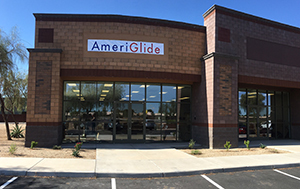 AmeriGlide is proud to bring our award winning service and selection to the Phoenix area. As the leading stair lift provider in the country, we have provided thousands of customers with not only quality stair lifts but also wheelchair lifts, vertical platform lifts, bath lifts, walk in tubs, vehicle lifts, and dumbwaiters. Now you can visit our Phoenix showroom and see for yourself why AmeriGlide stair lifts are the #1 choice for your mobility needs. The AmeriGlide vertical lift's smooth and quiet performance makes this a dependable and versatile unit. Unlike any other dumbwaiter, the Ameriglide Express Dumbwaiter uses a special drive train and	track system that makes it easier to install and economical to own. The AmeriGlide Elite Residential Elevator is the most affordable option for those that want their very own elevator in their home.